Mr. Mo Desong worked for MCID (Maersk Container Industry Dongguan Ltd) for three years since 2006. He died on October 30, 2009, after falling ill nine months earlier. He was diagnosed as having chronic occupational diseases and mild benzene poisoning, and died of multiple organ failure. MCID had delayed Mo’s application for occupational diseases diagnosis and treatment for five months. 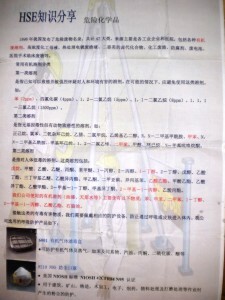 His death might have been avoided if MCID had not obstructed both the sending of Mo to the Guangdong Provincial Hospital for Prevention and Treatment of Occupational Diseases (Occupational Hospital hereafter) in time, and the providing of necessary documents to this hospital for Mo’s diagnosis within the time limit set by this hospital. Mr. Mo joined the company on 12 June 2006 as a product finishing worker. His work meant that he had contact with paint and thinner when he processed containers during the final phase of production. He fell sick in March 2009 and went to a local hospital (Dongguan Machong Hospital) close to the factory, where he was diagnosed as having leukopenia. On 8 May, 2009 he was admitted to this hospital for treatment on his own account, and was hospitalized there until the middle of August. During this period, on 27 May, he paid a visit on his own account to the Occupational Hospital, which is a certified hospital for the diagnosis and treatment of occupational disease, and found that he had thrombocytopenia and hearing loss. He then approached the company’s management, providing them with the diagnosis and requesting that they send him to the Occupational Hospital for further diagnosis and to ascertain if the diseases were occupational. 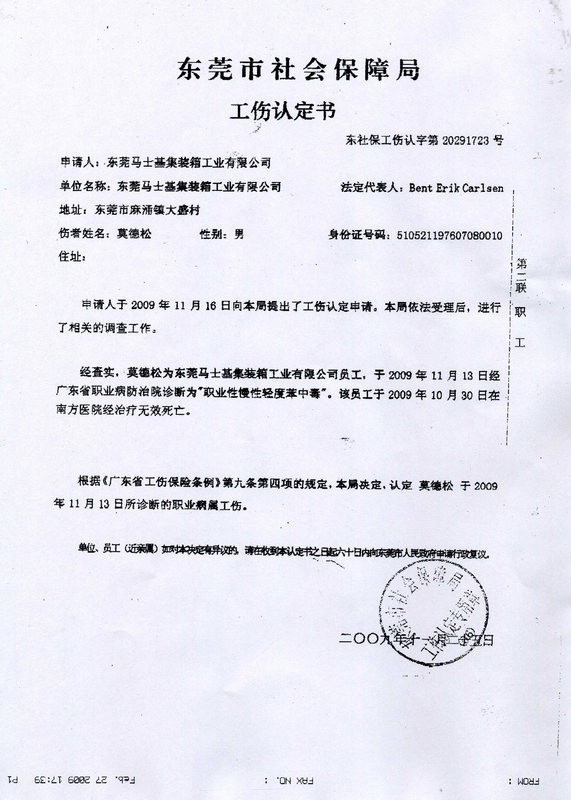 Cai Zhongtao, the manager, flatly refused however, and went so far as to say that they would not accept the diagnosis of the Occupational Hospital; the only hospital reports that they recognized were those issued by the Hospital of Guangzhou Developing Zone. “when the workers are harmed or there is the possibility of them being harmed by acute occupational hazards, employers must arrange timely treatment, medical checks and observation for the workers. The medical cost incurred should be borne by the employers”. So MCID’s refusal to send Mo to the Occupational Hospital at the end of May, when Mo presented to MCID the Occupational Hospital's diagnosis and complained about the suspected occupational diseases, was a violation of clause 34 of the law. The company’s management then wanted to dismiss Mo quickly so as not to be held legally responsible for his treatment, and to avoid being discredited for causing the occupational disease. Since his contract was going to expire (his contract was from June 12, 2008 to June 11, 2009) manager Cai told Mo that they would not renew his contract and that he must quit. They sent him to the Hospital of Guangzhou Developing Zone for the exit medical check (not for an occupational disease diagnosis or treatment, as the company later claimed) which the law required. The Occupational Hospital requested the MCID on July 9 for its “consecutive annual assessment reports of occupational disease hazards”, but on August 24 it only acknowledged the receipt of “2008 workplace testing report”. Even if “workplace testing report” is identical with “assessment reports of occupational disease hazards”, the previous years of these reports had not been sent as requested. Mo’s “Occupational Health Monitoring File”. The full name list of all Mo's colleagues who work on the same post, their “Occupational Health Monitoring Files”, especially their blood tests. A statement by MCID that whether there were workers who suffered similar illness as Mo. To provide all materials concerning Mo's hospitalization in all hospitals, including test results, all medical records, and testing results etc. The withholding of these important documents was in violation of clause 48 of the law on the Prevention and Treatment of Occupational Diseases, which requires employers to send to the hospitals all the necessary documents when asked. The August 24 notice from the Occupational Hospital also told MCID that the hospital considered that Mo was suspected of having occupational diseases and that the company should send him “as soon as possible” to their hospital for further medical diagnosis. It took two more weeks for MCID to do this simple act. When Mo was sent to the hospital on September 7, by this time he was already very sick. Even then MCID had still not cooperated with the hospital in providing necessary information about the working environment, which contained benzene particles in the air. 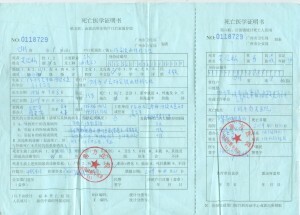 When Mo was admitted to the hospital on September 7, the admission diagnosis stated that “benzene in the working environment needs further testing”; 20 days later, on September 27, when he was discharged, his discharge certificate bore the same sentence, with the additional remark “diagnosis still pending”. He was then admitted to Nanfang Hospital, which is not qualified to diagnose and treat occupational diseases. On 30 October 2009 he passed away, survived by his wife and his nine year old daughter. According to Mrs Mo, MCID did not fully cooperate with the hospital in providing necessary documents even after Mo died. To sum up, at every step Mr. Mo was obstructed by the management in getting a proper medical check and treatment for his occupational disease. Two weeks after his death the Guangdong hospital finally issued an official diagnosis confirming he had been suffering from chronic and mild occupational benzene poisoning. 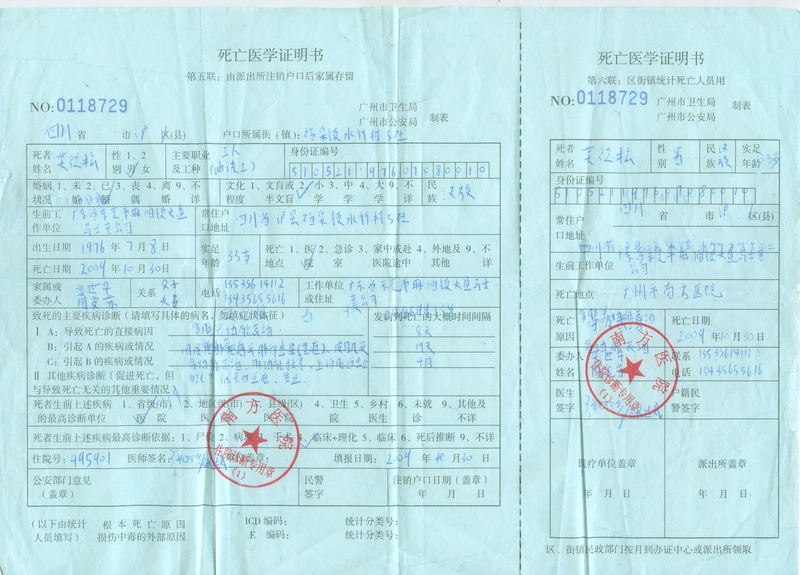 On November 25, 2009, the Dongguan Municipal Social Security Bureau issued Mr. Mo’s ‘Certificate of Confirmed Occupational Injury’ to Mrs. Mo, confirming that his occupational disease was work related. 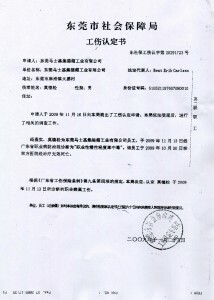 On December 7, in accordance to clause 30 of the Guangdong’s Work Injury Insurance Ordinance which stipulates the compensation for work related death, Mrs Mo applied to the Bureau for compensation of 66 months of Mo’s wages for his death, as stipulated by law, and on December 22, Mo family was granted 375,487.2 RMB of pensions, subsidy and compensation for Mo’s parents, his daughter, and for his own death. There was no compensation for Mrs Mo. She is now considering legal action. 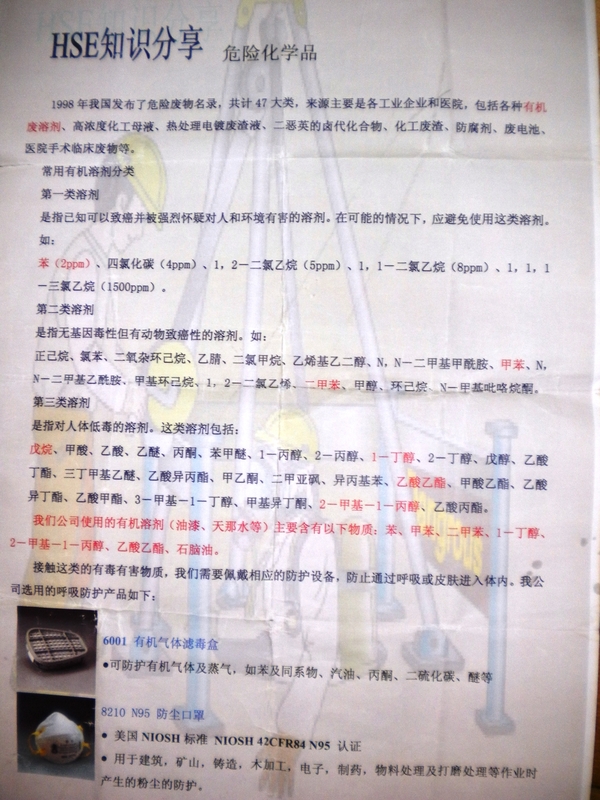 It must be noted that benzene poisoning often leads to internal bleeding, and may cause renal diseases. Obstructed the processing of Mo’s May 2009 request for occupational disease diagnosis and treatment of his illnesses, which resulted in the missing of the opportunity to treat him during the five month period, until his death in October, in which Mo’s illnesses grew more and more serious. Any attempt to defend MCID by saying that it had not used chemicals which contained benzene is futile. MCID used a lot of paint and thinner, and they contain benzene. In fact, one of the OSH notices posted by MCID clearly states and highlights in red that “the paint and thinner we use contains benzene and toluene.....” (See picture below). The director of MCID, Mr. Hultengren, in its reply to GM on February 3, 2010, defended itself by saying that Mr. Mo might have contacted benzene earlier in another plants. Mr. Hultengren forgot that it is the employer’s legal responsibility to make entry medical check for all employees to make sure they are healthy prior their contracts become effective, and that if Mo was sick with benzene poisoning prior his employment at MCID Mr. Hultengren would not have hired Mr. Mo in the first place. We condemn MCID for its violation of the legal rights of Mr. Mo, which caused his poisoning and might have caused his death. Hence the company management should, on top of the amount of compensation paid to Mr. Mo’s family as stipulated by law, pay additional compensation for having delayed Mr. Mo’s hospitalization. 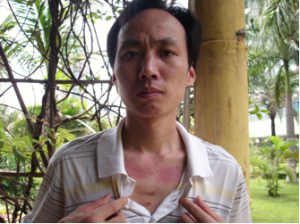 Mr. Mo’s case is not an isolated incident; it was the result of institutionalised negligence and denial of labor rights and occupational health by MCID. Besides Mr. Mo’s case, there have been many more suspected cases, as well as four confirmed cases of occupational diseases: Hu Changqing (asthma), Li Xin (benzene poisoning) and Li Jiming (hearing damage). These diseases were the result of the continuous violation of the Law on the Prevention and Treatment of Occupational Diseases by MCID management. For instance, MCID’s management failed to inform workers about the existence of health hazards in the factory and failed to provide adequate personal protection equipment. It has also been the company’s policy to make things difficult for any worker who complains about suspected occupational diseases; in many instances it has unlawfully dismissed them. We demand that MCID stop harassing workers with suspected or confirmed occupational diseases and to act in full accordance with the law. With the connivance of A. P. Moller- Maersk, MCID continues to violate basic labor rights and might have caused the death of Mo. Therefore it too must also be held responsible. We have pointed out repeatedly that MCID’s management is corrupt and that by not doing anything to punish it --- while workers who suffer from occupational diseases are punished with dismissal and neglect --- only encourages this company to further continue its malpractice and even to break more laws.